The author of this handbook has over 20 years of experience in servicing Pressure Cleaning equipment and knows what works in helping you keep your equipment in tip-top shape, saving you time in the field and costly repairs. 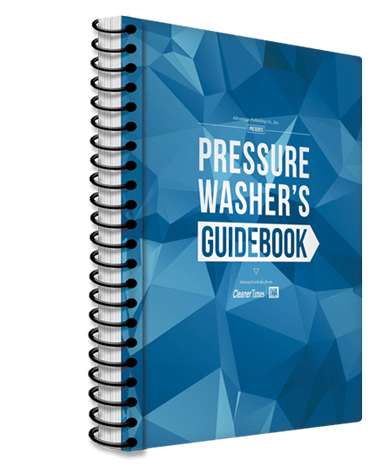 Written by an engineer with many years of experience in servicing pressure washers, this handbook will help you purchase the right equipment and keep your equipment up and running. Never miss a job because of an equipment failure. After all, time is money; costly repairs eat into your bottom line. Chemicals Through the Pump: Can They Ruin It? Show Your Customers You Are Ready For Business. When starting out in any business, you need to have the correct tools for your job. One key to being ready for business is to project a professional image and show the customer that you have a structure and guidelines you operate within. This will give your customer the confidence to do business with you. The forms below will allow you to set appointments, create agreements for service, establish your policies, hold you harmless in certain events, and finally to invoice your customer.You can customize them with your logo, address, and make as many copies as needed since you own the template and have full rights. You will automatically download the file once you have completed the payment. * This may not work if you download it from cellular phones. Best to download it from your desktop or laptop computers.